Come Volunteer with us... We need YOU!!!! 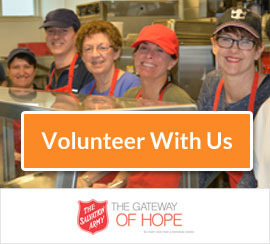 The Gateway of Hope is always looking for passionate, service-driven volunteers. 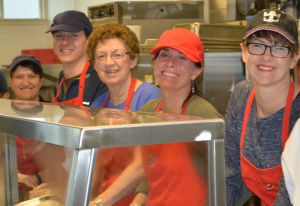 Volunteers are a part of the fabric that makes up The Salvation Army and Gateway of Hope: without volunteers we could not operate on a daily basis! 1. Fill out a Volunteer Application Form. Please see all downloadable forms below. 2. Are you 18 years old or younger? Please have a parent or guardian fill out a Parental Consent Form. The Volunteer Coordinator will be in contact with you to set up a short interview and orientation. We want to get to know you as a person and help you get to know the Gateway of Hope! Before you come in for an interview, look at the opportunities we have. What are you interested in? We don’t always have positions within these opportunities – but, we are open to creating new positions! We do our best to place volunteers in the most suitable roles that interest them and work with their schedules! 1. Are you coming in with a group? Please contact the Volunteer Coordinator directly. 2. Any volunteer under the age of 19 needs to have their parents or guardians sign a Parental Consent Waiver. Generally, we do not except volunteers under the age of 16 unless of special circumstances. Please contact the Volunteer Coordinator directly in this situation. 3.Are you looking for a one-time opportunity? Please fill out the application and contact the Volunteer Coordinator with more information. We do allow Community Service Worker hours to be completed under certain criteria. Please fill out the Community Service Application. , and contact the Volunteer Coordinator directly. Please note: A placement is not guaranteed. Every active individual volunteer must undergo a Criminal Record Check with the Ministry of Justice (an RCMP clearance letter will not suffice). Please try the online criminal record check system, the instructions are available in Section i of the Volunteer Application (last section). Alternatively, a Manual Criminal Record Check Consent Form can be filled out and returned to Gateway of Hope for further processing. Note: One-time group or individual volunteers are a special case and may not need a criminal record clearance for volunteering. For more information or clarification, please contact our Volunteer Coordinator. Volunteer Applications for our 2018 Christmas Kettle Campaign will be available in the Fall! You may have seen these volunteers before, red kettle at their side, bells in their hands, cheer in the air. This campaign runs from mid-November to December 24th. Each day the campaign is open we have approx. 100 shifts to fill. Over the five week campaign that’s over 3000 shifts! In one day, at one location, kettle donations are on average $500. Help us this year to reach our $150,000 goal! Come back in September when we open our volunteer registration for this important campaign!